Denon DJ, a leading manufacturer of premium-grade DJ equipment, announces that its popular DN-X1600 Digital DJ Mixer has received Native Instruments™ TRAKTOR® SCRATCH PRO certification. “TRAKTOR SCRATCH PRO”-certified products are premium-quality mixers with integrated audio interfaces (sound cards) that meet the highest standards for professional sound quality and seamless integration within a TRAKTOR SCRATCH PRO setup. The certification will ensure that the DN-X1600 will work in perfect harmony with TRAKTOR SCRATCH PRO. The certification of the Denon DN-X1600 Professional Digital Mixer allows users of TRAKTOR SCRATCH PRO to connect their computer, analog turntables or Denon DN-S3700 Digital Media Turntables directly to the mixer, and use time-code control instead of the external AUDIO 8 DJ interface. TSP v126 (or higher) includes DN-X1600 support within the system configuration wizard for easy setup. With the addition of TRAKTOR SCRATCH PRO certification, the DN-X1600 continues to be perfect for all DJs and electronic musicians, from professional club and touring DJs, to party DJs and bedroom mix artists. The DN-X1600 is currently available with a U.S. MSRP of $1299.99. For more information, please visit www.denondj.com. The DN-X1600 Digital DJ Mixer offers superb sound quality, durability, reliability, operability and visibility. Based on the same core engine as Denon DJ’s flagship DN-X1700, the DN-X1600 is an extremely affordable and versatile four-channel digital mixer with a variety of features. Denon’s engineers have provided every capability professional DJs will require: working with vinyl, CD, digital files, DJ software applications via laptops and USB storage devices. In addition to its stellar digital mixing capabilities, the DN-X1600 provides an exclusive MIDI control UI area for functionality and ease-of-use for the rapidly growing PC DJ market. The DN-X1600 features a simple spacious layout, with highly tactile controls widely and logically laid out to enable easy operation during performance. This unit features large high-quality rubberized knobs, high-visibility VFD display and extended 16-point LED channel and output metering. 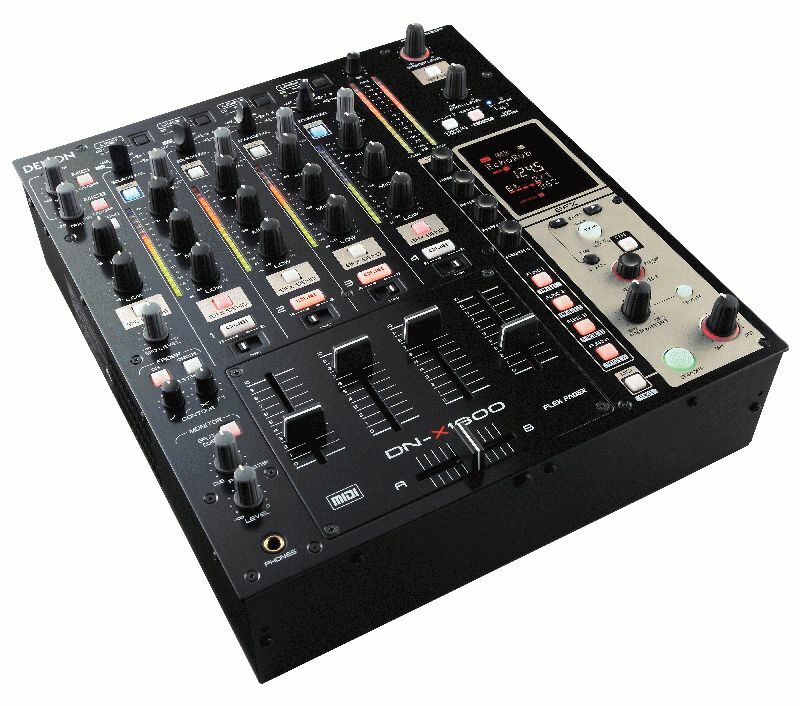 A first for any DJ mixer introduced to date, the DN-X1600 is also equipped with V-LINK, a function developed by Roland Corporation® that allows DJ performers to simultaneously integrate audio and video. Connecting devices that support V-LINK to the mixer’s MIDI terminals (such as the EDIROL V-4 or V-8) make it possible to perform a wide range of visual effects linked with the tempo of the music. As with all of Denon DJ’s products, the DN-X1600 offers superior sound quality, utilizing a 32-bit Floating DSP and a 32-bit D/A converter, along with a large capacitor and large-diameter winding wire for the transformer. Ideal Grounding Construction protects the mixer from external noise. It features a high-quality Phono Amplifier with high sound/noise ratio, equivalent to that of Denon Consumer Premium Audio products. The unit’s Discrete Transistor construction for the Mic Amplifier realizes a studio console class’ low noise level (EIN: -126dB). A total of 14 digital effects open the DN-X1600 up to a variety of sounds and mixing techniques. All effects can be freely assigned to any channels. Effects include Delay, Echo, Ping-Pong Delay, Trans, Flanger, Filter, Phaser, Reverb, Echo Reverb, Loop, Reverse Loop, Pitch Shift, Beat Breaker and Beat Scratch (Ping-Pong Delay, Echo Reverb and Beat Scratch are newly developed). The DN-X1600 offers a number of connectivity features, adding to its versatility as an indispensable DJ tool. Connectivity capabilities include: an exclusive MIDI control UI area for better ease-of-use; eight-channel (4x L/R stereo) USB Audio I/F soundcard (PC/Mac®); Matrix Input Assign with DVS direct mode for control signal (timecode) DJ applications; 4 MIDI Layer and MIDI Remote functions for a variety of control; and a Low Latency ASIO Driver. In addition to its ease of use, the DN-X1600’s construction ensures reliable performance. The DN-X1600 is extremely rugged and portable. The three-band Isolator features variable Cross-over Frequency. The unit comes standard with dust-free 60-mm long stroke Channel Faders, in addition to 45-mm FLEX Cross Faders with A/B Cut Position adjustment and travel tension control.